If wood gas passes into flame, it can ignite and less un-combusted smoke escapes. Which of the following patterns has the greatest potential for clean burning? Maybe “the devil is in the details”? The pattern that Dr. Winiarski often tries is downdraft/down feed. The wood is burned at the bottom of a vertical stick that can fall down as it is consumed. Air is pulled down alongside the sticks and into the fire. 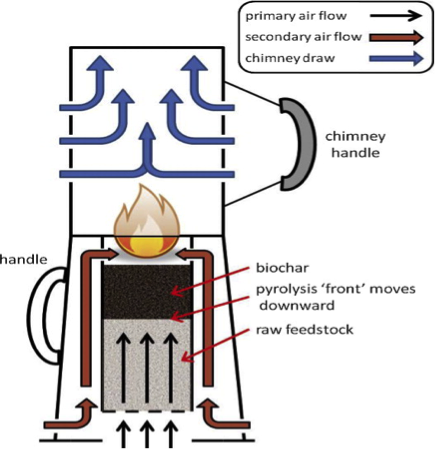 The charcoal falls below the sticks and in front of the flame path as flame is pulled horizontally into an insulated space by the draft in the Rocket short chimney. Side feed/side draft is how most people feed a fire. The sticks are pushed into the fire as they burn. In this pattern, the fire creates charcoal that lies underneath the burning sticks of wood and helps to keep the fire going. When the tips of the sticks burn combustion is fairly clean. The sticks and fire are directly under the short chimney in the Rocket stove and the flame is pulled up towards the pot. Top Lighting a batch of fuel. Sticks, for example, are loaded vertically, packed fairly tightly and hold each other up in a crucible. The entire top of the fuel bed in lit and is on fire. The fire slowly travels down into the crucible. The wood gas rises and enters the fire from below. If you wanted to minimize escaping smoke would you light the fire on the bottom or side or top of the sticks? If the wood sticks are lit on the sides or on the bottoms the wood gas must be forced by the stove to join into the fire. Lighting the entire top of the batch of fuel has the natural advantage that all wood gas passes into flame. 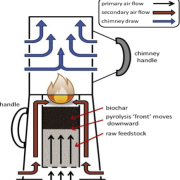 Masonry heating stoves have often used this top burning technique to clean up combustion. In each case the same principle applies: 1.) All the wood gas must go into the hot flames and 2.) Be well mixed there with air 3.) For a long enough time for complete combustion to occur.